26 Years Worth of Vacation? In my book Big Travel, Small Budget I talked about how you could take a career break on the cheap, no matter what your starting budget is. The tactics I talked about in that book are extremely effective and have made long-term travel more accessible to the tens of thousands of people that have downloaded it. I fully believe that taking a long-term career break to dedicate yourself to travel or to your hobbies and ambitions is one of the best things you can do with your time. Time is our absolute most precious asset and it is completely non-renewable. 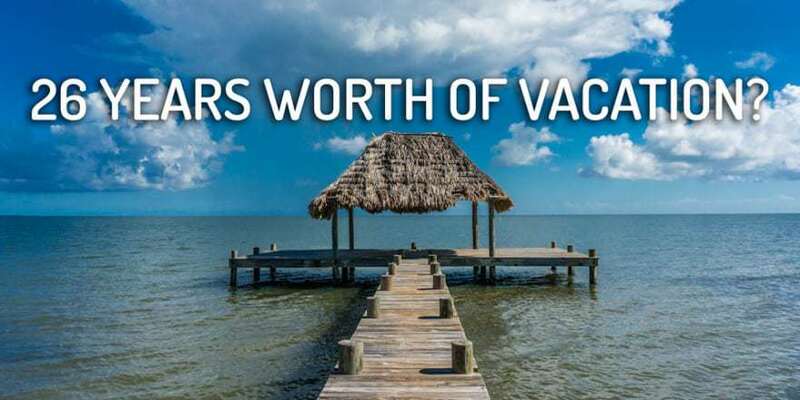 Taking just one year off of work for a deliberate career break is equivalent to approximately 26 years worth of the average American’s vacation time (2 weeks per year for 52 weeks is 26 years). 26 years… Or your accumulated vacations between the ages of 30 and 56. Yet, even with the best tactics in the world, you will still find most people unable to make the leap… Unable to reclaim their time and break away from the 9-to-5. Even if they say it’s one of their biggest goals. Why is big change so very difficult to enact? I’ve been chatting with many readers, doing a lot of reading and research, and have uncovered some pretty fascinating info, backed up with psychology and clinical studies about why even when we *really* want something, even when we have all the tactics, we still fail to follow through and enact the changes we need and want to be successful. That’s why I’ve dedicated myself to writing a new book. If Big Travel, Small Budget was the How To in terms of traveling on the cheap, my new book will be the Why and How To Actually Break Away book. The reality of the matter is that each of us are the biggest obstacles to our own success. More specifically it’s our mindset and fears that often sabotage us before we even get out the gate. I’ve seen it time and time again with readers who write in to me but are afraid to make the leap. In my new book I will be addressing a number of absolutely crucial things in order to set yourself up for success in achieving your career break goals. Dreams/goals for the future and how they guide our present day-to-day. Recognizing your fears about making the leap and how to build a plan and work around them. How the 80/20 principle can help us cut the extraneous stuff from our lives in order to focus more on what really matters. The importance of minimalism and how the paradox of choice hinders us all. Setting SMART Goals and how to hold yourself accountable to making them happen. Why you need an inciting incident and how you can create one for yourself. The need for risks and challenges in our day-to-day life and how security is a recipe for discontent. Taking control of your finances and conquer debt. How frugality and freelancing are the ticket to freedom. Why adventure is a crucial part of life for all of us. The book is tentatively titled Desk to Discovery: How to Beef Up Your Obituary, Stop Delaying, and Start Living by Leaving the 9-to-5. I’m preparing to release the book soon and if you sign up in advance you will get the book absolutely free before it officially launches. Want to join the launch team or help spread the word about the book? Join the Team.